رحیمی, اکبر, راد, عباس, عالم تبریز, اکبر, موتمنی, علیرضا. (1397). ارائه مدل ساختاری تفسیری زنجیره تامین تاب آور درصنایع دفاعی ایران. فصلنامه مدیریت نظامی, 18(71), 31-70. اکبر رحیمی; عباس راد; اکبر عالم تبریز; علیرضا موتمنی. "ارائه مدل ساختاری تفسیری زنجیره تامین تاب آور درصنایع دفاعی ایران". 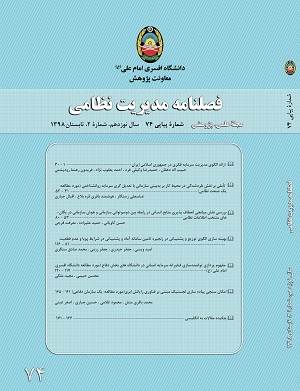 فصلنامه مدیریت نظامی, 18, 71, 1397, 31-70. رحیمی, اکبر, راد, عباس, عالم تبریز, اکبر, موتمنی, علیرضا. (1397). 'ارائه مدل ساختاری تفسیری زنجیره تامین تاب آور درصنایع دفاعی ایران', فصلنامه مدیریت نظامی, 18(71), pp. 31-70. رحیمی, اکبر, راد, عباس, عالم تبریز, اکبر, موتمنی, علیرضا. ارائه مدل ساختاری تفسیری زنجیره تامین تاب آور درصنایع دفاعی ایران. فصلنامه مدیریت نظامی, 1397; 18(71): 31-70. با توجه به اهمیت زنجیره تأمین در کسب مزیت رقابتی، گفته می‌شود رقابت بین سازمان‌ها با رقابت بین زنجیره‌های تأمین آن‌ها جایگزین گردیده است. بنابراین مدیریت مؤثر زنجیره تأمین، عاملی اساسی در موفقیت سازمان‌ها محسوب می‌گردد. اختلالات به‌عنوان نتایج رویدادهای غیرمنتظره، جزء غیرقابل‌تفکیک از زنجیره‌های تأمین سازمان‌های امروزی است که در شرایط عدم اطمینان به فعالیت می‌پردازند. رویکرد تاب‌آوری در مدیریت زنجیره تأمین برای مقابله با این رویدادهای غیرمنتظره در زنجیره تأمین و بهبود سریع و بازگشت آن به حالت اولیه و قبل از وقوع رویداد، معرفی گردیده است. نقش محصولات دفاعی در ارتقاء توان بازدارندگی در مقابل تهدیدات نظامی، اهمیت و ضرورت به‌کارگیری رویکرد تاب‌آوری در مدیریت زنجیره تأمین صنایع دفاعی را به‌خوبی نشان می‌دهد. این تحقیق باهدف تدوین مدل تاب‌آوری زنجیره تأمین صنایع دفاعی، ابتدا به شناسایی مهم‌ترین اقدامات تاب آور زنجیره تأمین پرداخته، سپس با استفاده از تحلیل عاملی اکتشافی و تأییدی، آن‌ها را دسته‌بندی نموده و در ادامه با استفاده از مدل‌سازی ساختاری تفسیری(ISM) به ارائه مدلی که روابط بین این اقدامات را نشان می‌دهد، می‌پردازد. قدرت نفوذ و وابستگی اقدامات نیز با استفاده از تکنیک MICMAC، تحلیل گردیده است. نتایج تحقیق نشان می‌دهد که از مجموع37 اقدام معرفی‌شده در تحقیقات پیشین برای زنجیره تأمین تاب آور، 19اقدام در تاب آور سازی زنجیره تأمین صنایع دفاعی مؤثرند که در قالب 5دسته و شامل ارتباط با تأمین‌کننده، انعطاف‌پذیری، چابکی، افزونگی و امنیت می‌باشند. ارتباط با تأمین‌کننده به‌عنوان پایه‌ای‌ترین و محرک‌ترین اقدام و اقدامات افزونگی، چابکی و امنیت به‌عنوان وابسته‌ترین و تحت تاثیرترین اقدامات برای تاب‌آوری زنجیره تأمین صنایع دفاعی معرفی شدند. بنابراین مدیران قبل از هر چیز، می‌بایست بر برقراری ارتباط مؤثر با تأمین‌کنندگان جهت ارتقاء تاب‌آوری زنجیره تأمین متمرکز گردند. نوروز شاد، نادر،(1396)، " رابطه قدرت دفاعی و بازدارندگی"، سایت مرکز اسناد و تحقیقات دفاع مقدس. Azevedo, S.G., Machado, V., Barroso, A. and Cruz-Machado, V. (2008), “Supply chain Vulnerability: environment changes and dependencies”, International Journal of Logisticsand Transport, Vol. 1 No. 1, pp. 41-55. Blos, M.F., Quaddus, M., Wee, H.M. and Watanabe, K. (2009) Supply chain risk management (SCRM): a case study on the automotive and electronic industries in Brazil, Supply Chain Management: An International Journal, Vol. 14, No. 4, pp. 47–52. Brandon-Jones, E., Squire, B., Autry, C. W., and Petersen, K. J. (2014) A ontingent resourcebased perspective of supply chain resilience and robustness, Journal of Supply Chain Management, 50(3), pp. 55–73. Briano, E., Caballini, C. and Revetria, R. (2009), “Literature review about supply chain vulnerability and resilience”,Proceedings of the 8th WSEAS International Conference onSystem Science and Simulation in Engineering, pp. 191-7. Carvalho, H. & Cruz-Machado, V. (2011). “Integrating lean, agile, resilience and green paradigms in supply chain management (LARG_SCM)”, Faculae de Cadencies e Technologic da Universidad Nova de Lisboan: 27- 48. Carvalho, H., Azevedo, S. G., and Cruz Machado, V. (2012). Agile and resilient approaches to supply chain management: Influence on performance and competitiveness. Logistics Research,4, pp. 49–62. Carvalho, H., Barroso, A. P., Machado, V. H., Azevedo, S., and Cruz-Machado, V. (2012),Supply chain redesign for resilience using simulation, Computer and Industrial Engineering, 62,pp. 329–341. Choi, S.B., Min, H., Joo, H.Y. and Choi, H.B. (2016),“Assessing the impact of green supply chain practices on firm performance in the Korean manufacturing industry”,International Journal of Logistics Research and Applications: A Leading Journal of Supply Chain Management, Vol. 20 No. 2, pp. 129-145. Christopher, M., & Peck, H. (2004). Building the Resilient Supply Chain.The International Journal of Logistics Management, 15(2), 1–14. Cruz, P. E. B. E., (2012). ” Lean, Agile, Resilient and Green Supply Chain Management Interoperability Assessment Methodology”. Dissertação para obtenção de grau de Mestre em Engenharia e Gestão Industrial (MEGI), Universidade nova de lisboa. Falasca, M., Zobel, C.W. and Cook, D. (2008), "A decision support framework to assess supply chain res ilience", in Fiedrich, F. and Van de Walle, B. (Eds), paper presented at International ISCRAM Conference, Washington, DC. Pp: 596–605. Feleming, j. Redogal, R. (2010), “Resilience, an Evolving Concept: A Review of Literature Relevant to Aboriginal Research” Canadian Institutes health research 6(2): 7–23. Hohenstein, N.-O., Feisel, E., Hartmann, E., & Giunipero, L. (2015). Research on the henomenon of supply chain resilience: a systematic review and paths for further investigation. International Journal of Physical Distribution & Logistics Management, 45(1/2), 90–117. Hugos, M.(2006). “Essential of supply chain management”. John Wiley & Sons, Inc.
Juttner, U. (2005), “Supply chain risk management – understanding the business equirements from a practitioner perspective”,International Journal of Logistics Management, Vol. 16 No. 1, pp. 120-41. Juttner, U. and Maklan , S. (2011). Supply chain resilience in the global financial crisis: an empirical study, Supply chain management: An international journal , 16(4), pp.246-259. Kamalahmadi, M., & Parast, M. M. (2016). “A review of the literature on the principles of enterprise and supply chain resilience: Major findings and directions for future research”. International Journal of Production Economics, 171, 116–133. Narasimhan, R. and Talluri, S. (2009) Perspectives on risk management in supply chains. Journal of Operations Management, Vol. 27, No. 2, pp. 114–118. Petit, F. (2010).Concepts d’analyse de la vulnérabilité des infrastructures essentielles-prise en compte de lacybernétique, Montreal Polytechnic Thesis. Ponis, S. T., & Koronis, E. (2012). Supply chain resilience: definition of concept and its formative elements. Journal of Applied Business research, 28(5), 921. Ponomarov, S. and Holcomb, M. (2009), “Understanding the concept of supply chain resilience”,The International Journal of Logistics Management, Vol. 20 No. 1, pp. 124-43. Rao, S. and Goldsby, T.J. (2009) Supply chain risks: a review and typology, The International Journal of Logistics Management, Vol. 20, No. 1, pp. 97–123. Rice, J. B., & Caniato, F. (2003). Building a secure and resilient supply network. Supply Chain Management Review, 7(7), 22–30. Simchi-Levi, D., Kaminsky, P., and Simchi-Levi, E. (2008). “Designing and Managing the Supply chain: Concepts, Strategies and Case Studies”. 3rd Edition, McGraw-Hill Irwin, Boston. Stock, J.R., Boyer, S.L., 2009. Developing a consensus definition of supply chain management: a qualitative study. International Journal of Physical Distribution & Logistics Management 39 (8), 690-711. Tang, C.S. (2006), “Robust strategies for mitigating supply chain disruptions”, International Journal of Logistics: Research and Applications, Vol. 9 No. 1, pp. 33-45. Wagner, S. and Bode, C. (2006) An empirical investigation into supply chain vulnerability, Journal of Purchasing and Supply Management, Vol. 12, No. 6, pp., 301–312. Zsidisin, G.A. and Smith, M. (2005), “Managing supply risk with early supplier nvolvement – a case study and research propositions”, The Journal of Supply Chain management,Vol. 41 No. 4, pp. 44-57.